Xilinx has launched an online development hub to support software, hardware and system developers build next-generation embedded vision systems. The puropse of the hub is to help developers overcome challenges associated with design, cost and commercialisation of embedded vision. The online platform comes two months after camera manufacture Basler – along with Xilinx, Nvidia, and industrial computer manufacturer Advantech – established an embedded vision community, ImagingHub, to encourage engineers to work on joint embedded vision solutions, find project partners, share knowledge and reference designs. Xilinx’s Embedded Vision Developer Zone is aimed at providing a one-stop location to speed-up the development of next-generation vision systems employing sensor fusion, advanced computer vision algorithms, and real-time object detection and analytics capabilities based on machine learning techniques. The platform contains engineering resources comprised of optimised libraries for software development; vision IP for hardware developers; and projects and tutorials from Xilinx, Alliance Program Members and community developers. One project using Xilink’s development zone is working on face detecting technology. The logiFDT Face Detector and Tracker IP core finds and tracks facial features in video sequences, in real time, and returns full 3D head pose, gaze direction, and facial features coordinates. It is designed to improve human-machine interaction in wide range of applications, such as driver drowsiness detection, hands-free interfaces, virtual reality entertainment, and robotics. The software tool runs on the Xilinx Zynq-7000 All Programmable SoC-based MicroZed Embedded Vision Kit from Avnet Electronics Marketing. The tracking engine is sourced from technology partner Visage Technologies. 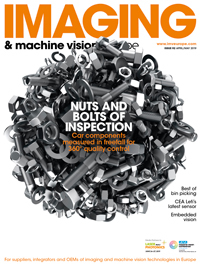 Embedded vision to transform industrial imaging?